Objective To investigate the obesogenic influence of maternal prepregnancy body mass index (BMI) and gestational weight gain (GWG) on infant weight at birth and 12 months postpartum in an Australian general population sample. Methods Data on 1,305 pregnant women were collected on prepregnancy BMI and GWG through maternal interview, on infant weight at birth through hospital records, and on infant weight 12 months postbirth through direct measurement. Relationships between prepregnancy, gestational weight exposures, and infant weight outcomes were assessed with and without adjustment for potential confounding. Results We observed a 14 to 24 g increase in infant birth weight for every 1 kg increase in maternal weight (infant birth weight: β(BMI) = 0.014, p < 0.000; β(GWG) = 0.012, p < 0.000; and 12 months: β(BMI) = 0.018, p < 0.000; β(GWG) = 0.024, p < 0.000). 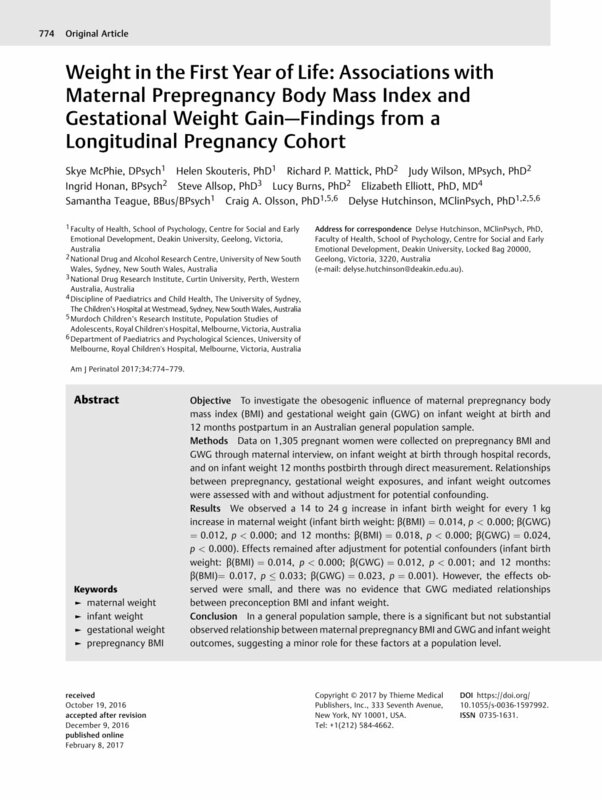 Effects remained after adjustment for potential confounders (infant birth weight: β(BMI) = 0.014, p < 0.000; β(GWG) = 0.012, p < 0.001; and 12 months: β(BMI)= 0.017, p ≤ 0.033; β(GWG) = 0.023, p = 0.001). However, the effects observed were small, and there was no evidence that GWG mediated relationships between preconception BMI and infant weight. Conclusion In a general population sample, there is a significant but not substantial observed relationship between maternal prepregnancy BMI and GWG and infant weight outcomes, suggesting a minor role for these factors at a population level. D. H., R. P. M., S. A., L. B., E. E., and C. O. initiated the Triple B Study, designed the data collection protocol, and obtained research funding. S. M. and H. S. designed this study. S. M. conducted all analyses and drafted the manuscript under the supervision of H. S., C. O. and D. H.
J. W. and I. H. assisted with data preparation and analysis. All authors commented on drafts of the manuscript.